When you're ready play live, the PRO-1 Ultra can plug into any size PA or amplifier with the Shadow® Performer HD™ preamp and NanoFlex HD™ pickup system, the same pickup system found in Epiphone’s legendary Masterbilt guitars as well as many other classic Epiphones. The PRO-1 Ultra also features a Solid Spruce top for superior sound with beautiful 5-layer Ivory and Black binding just like Epiphone’s vintage classics along with all of the PRO Collection's breakthrough innovations. Epiphone, one of the world’s oldest and most respected guitar makers, has just made playing and learning guitar easy for everyone. The PRO-1 Ultra, like all classic dreadnaught guitars, has a strong sound with a wide range of tones which makes the choice of the Shadow® Performer™ preamp and NanoFlex™ pickup system the key to the PRO-1 Ultra’s incredible value. 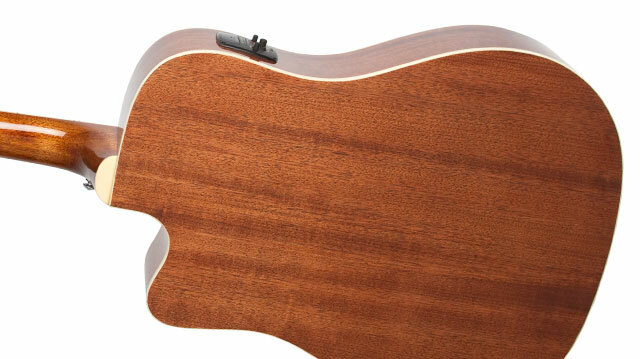 The PRO-1 Ultra’s Solid Spruce Top—the same top found on many vintage Epiphones—offers any level of player a “pro” sound from the first note. Over time, a Solid Spruce top will develop an even bigger “voice” as it ages, giving players that classic “vintage” Epiphone sound that has inspired everyone from The Beatles to Gary Clark Jr. The PRO-1 Ultra, like all classic dreadnought guitars, has a strong sound with a wide range of tones which makes the choice of the Shadow® Performer HD™ preamp and NanoFlex HD™ pickup system the key to the PRO-1 Ultra’s incredible value. The PRO-1 Ultra’s Solid Spruce Top—the same top found on many vintage Epiphones—offers any level of player a “pro” sound from the first note. Over time, a Solid Spruce top will develop an even bigger “voice” as it ages, giving players that classic “vintage” Epiphone sound that has inspired everyone from The Beatles to Gary Clark Jr. When plugged in, the Shadow® Performer HD™ preamp and NanoFlex HD™ pickup system offers a player total control of their sound regardless of the size of the venue you’re performing in. And the PRO-1 Ultra puts easy-to-use controls right at your fingertips including Master Volume, Bass and Treble EQ, an anti-feedback phase button, and a built-in chromatic tuner. The tuner also has “mute” switch to shut the pickup system off temporarily when plugging or unplugging your guitar. 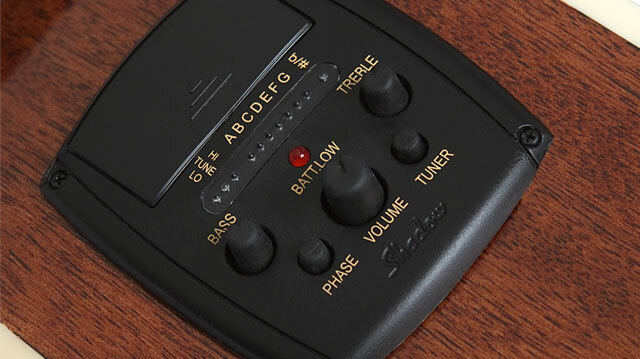 The Shadow® Performer™ preamp has a Low Battery indicator and runs on two (2) easy-to-find and long lasting AAA batteries. While traditional-sized dreadnoughts can be difficult for a new player to get used to, the PRO-1 Ultra has a reduced body depth which makes it easy to hold for long hours of playing. Another innovation the PRO-1 Ultra offers is a shorter scale Okoume neck, which makes learning chords and licks faster. PRO-Ease™ Lubricant makes the Okoume neck feel smooth and “worn in” on your fingers, and JumboPRO™ frets make it easy to hold down Epiphone’s custom Light Gauge Strings. A guitar that plays this easy has to be able to get in tune and stay in tune. The PRO-1 Ultra features Epiphone Deluxe tuners which have 18:1 ratio tuning gears that make finding the right pitch quick and intuitive. Ordinary tuners have only a 14:1 ratio, which makes fine tuning difficult, as the string never quite settles in the right place. But tuning is easy with the PRO-1 Ultra because the higher 18:1 gear ratio lets you adjust your tuning with greater precision so it’s easier to find the right pitch and stay there. 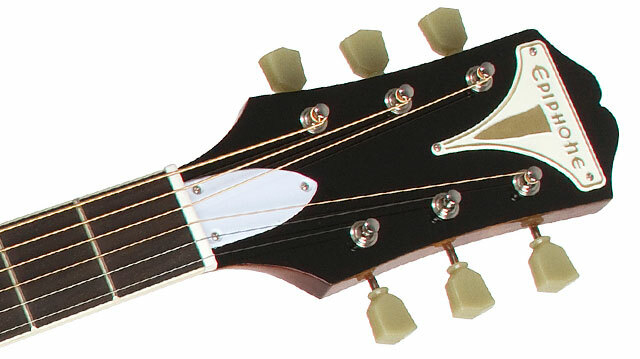 The PRO-1 Ultra has a newly designed EZ-String™ bridge that doesn’t use bridge pins. Bridge pins are notorious for being difficult to remove and difficult to seat into the bridge (not to mention easy to lose!). So changing a string and getting it in tune on the PRO 1 Ultra is fast and easy.